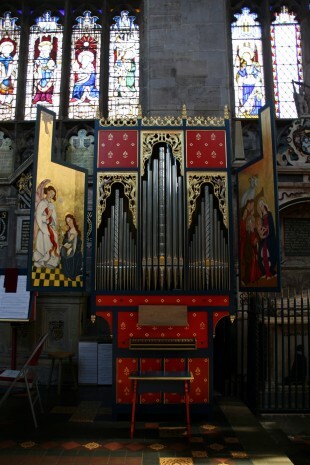 The St Teilo Tudor organ was made for the Bangor University research project http://www.experienceofworship.org.uk. It was originally housed in the reconstructed mediaeval church of St Teilo at the Museum of Welsh Life in St Fagans near Cardiff, but is now to be seen and heard at St Laurence Ludlow. You can hear the director of music at St Laurence, Shaun Ward playing the organ at https://www.youtube.com/watch?v=GxB5SlA401U. Shaun is a very talented man, who is clerk of the works at the church and author of a booklet about its remarkable collection of stained glass windows as well as its director of music and a solo organist.